All Division Nebraska State Champion! National Qualifier! For the first time in Nebraska history a Small School Division team has won the overall State Championship of Nebraska. On April 22-25, 2017 Mount Michael will represent our state at the national competition held in Madison, Wisconsin. The theme for the 2016-2017 Academic Decathlong was World War II. The 10 events were Essay, Speech, Interview, 6 Written subject tests on Art, Music, Economics, Literature, Science, Math concluding with the public Super Quiz on the Top of World War II. Mount Michael swept the small school division for top scorers on all levels. Honors Henry Callaghan, Scholastic: Jackie Kure, Varsity Kevin Arul. 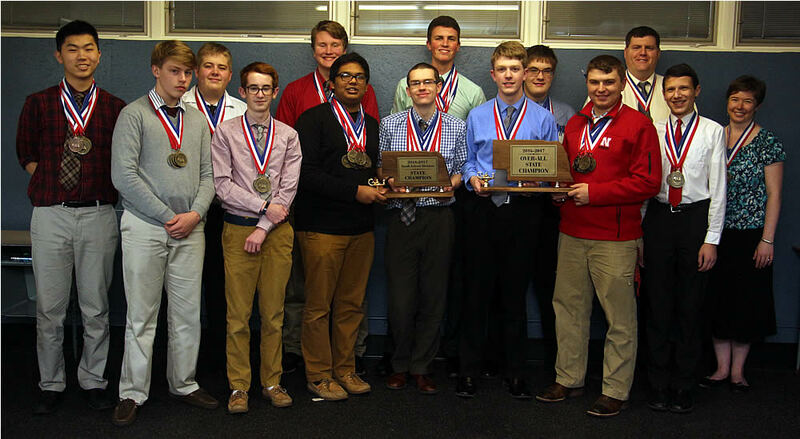 In the Super Quiz the Knights tied for 1st with Omaha Burke.